The fastest, most intuitive channel strip in the business. 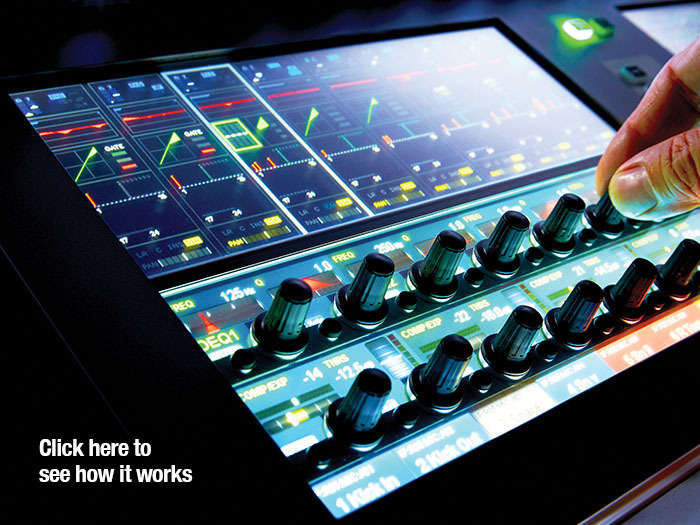 Anyone who has never used a Soundcraft Vi console would be forgiven for thinking that it’s just a digital console with touchscreens, and probably works like all the others… Look more closely however and you see that our Vistonics II screen system is a very different user interface from the norm. This is an interface that allows you to control and visualise your mix in a way that you’ve never experienced before—one that draws you in effortlessly to an amazing tactile experience, and makes working even the most complex of shows a real pleasure. And when the pressure is on, that ultra-fast and clear access to your mix is even more rewarding, helping you to keep calm and get the job done, whatever sonic curved balls come your way. This section of the website is designed to give you a closer look at what Vistonics II is and how it works - as close as we can get to you actually touching a real console. If you like what you see, download our offline software Virtual Vi or contact your Soundcraft distributor to arrange a demonstration. Vistonics II is the second generation of the original Vistonics interface pioneered on STUDER Vista live broadcast and theatre sound consoles. The key feature is a high-contrast glass touchscreen with a set of 16 assignable control knobs and push buttons which are mounted right on the surface of the glass, as can be seen in the photo at left. Each screen covers 8 channel strips and gives a full display of all the parameters for those channels on the upper section, and also allows any of those parameters to be adjusted using the rotaries and buttons. To adjust any section of the channel strip, just touch the icon representing that section, and the controls for it open up on the lower part of the screen. As you will see from the clickable demo, the use of colour coding and icon-based graphics makes it really easy to find which part of the channel you need to access, and on the lower section, the knobs are surrounded by colour-coded graphics that make it very obvious what those controls are doing at all times. You see visual feedback about the control function and settings as you are adjusting, right next to the control. This makes a real difference. Add to that the fact that most other consoles have only one or two screens for the whole surface, and you have extra scope for confusion as you wonder which bank of channels the screen is currently assigned to. Soundcraft Vi consoles have one Vistonics II screen for every 8 faders on the surface, giving unparalleled visibility of multiple channel parameters. Click the screen on the left to find out more.